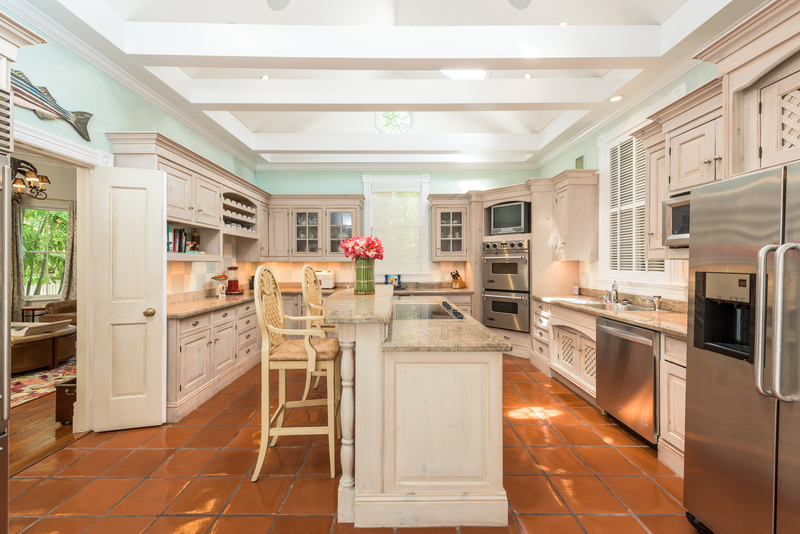 This enthralling Key West estate definitely makes its mark. 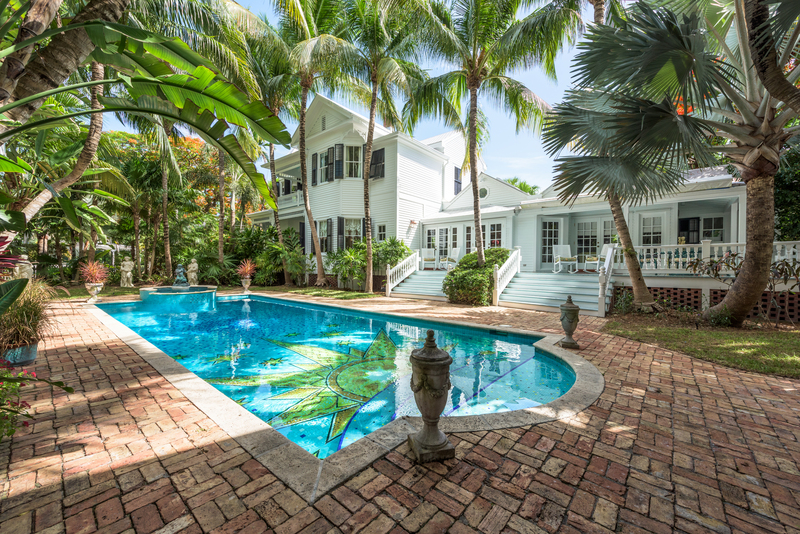 There are too few superlatives to adequately describe the extraordinary Gatsbyesque estate at 1017 Southard Street in Key West’s historic district. Encompassing over 20,000 square feet of terra firma and over 5,000 square feet of refined living space, this is undeniably one of the finest luxury estates on the island. A spectacularly restored 1890’s Queen Anne mansion reigns over this exquisite corner of paradise. The historic residence—with impeccable additions by architect and designer Guillermo A. Orozco—seamlessly blends the essence of grand formal living with the casual attitude of a tropical island lifestyle. The first floor features a dramatic entry hall, stunning octagonal living room, dining room with one-of-a-kind murals, spacious den, custom chef’s kitchen, and a vaulted master suite. Upstairs, one finds an octagonal guest suite and a sumptuous master. Victorian leaded glass doors, soaring ceilings, custom painted Dade County pine walls and floors, and welcoming porches take one’s breath away. A chef’s kitchen to die for. 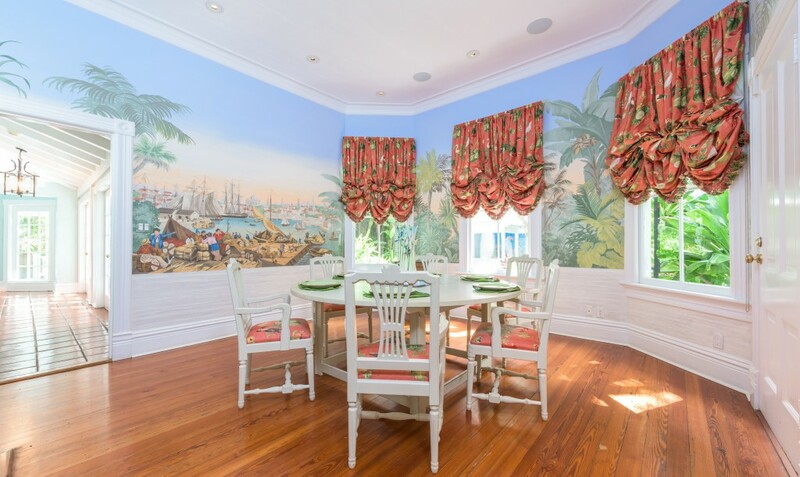 One-of-a-kind murals adorn the walls of the lovely dining room. Three additional structures beautifully compliment the main house. The inviting pool house offers an open air kitchen, changing room, bedroom, bath, and outdoor shower. A one car garage features a splendid guest apartment overlooking the pool. The charming two bedroom/two bath guest cottage features a private garden and off-street parking. The pool house and garage blend seamlessly with the historic home. The glorious gardens are an entertainer’s dream. Striking Banyan and Royal Poinciana trees tower over lush tropical landscaping. 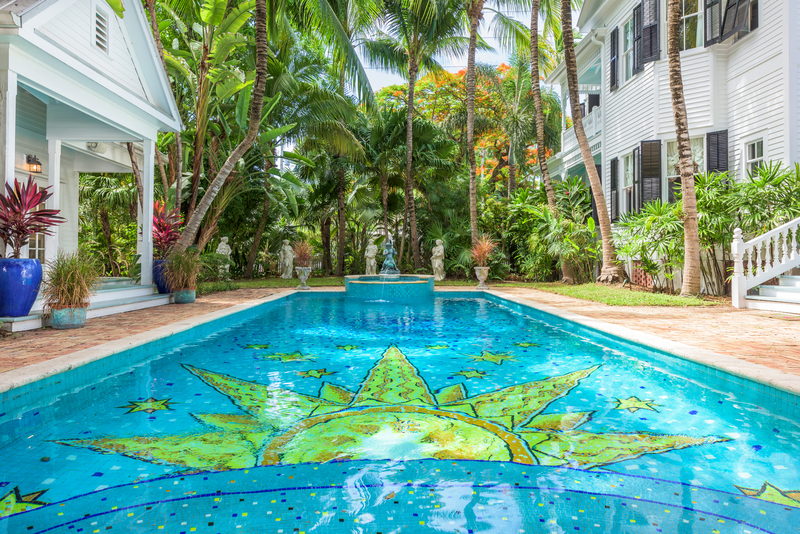 Sparkling in the sunshine, the unforgettable glass tiled pool is the estate’s crown jewel. 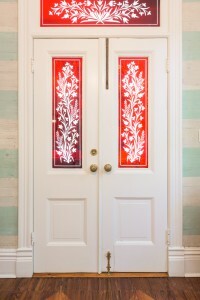 Hand laid glass tiles sparkle in the sunshine. 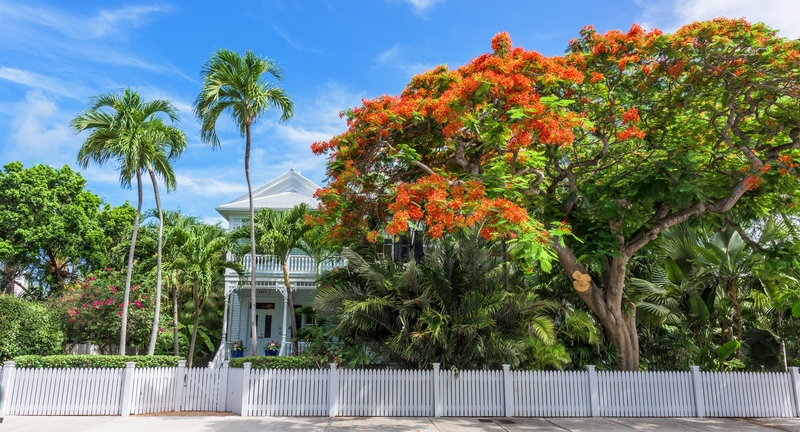 Priced at $7,400,000.00, the remarkable estate at 1017 Southard Street in Key West is undoubtedly worth every penny. 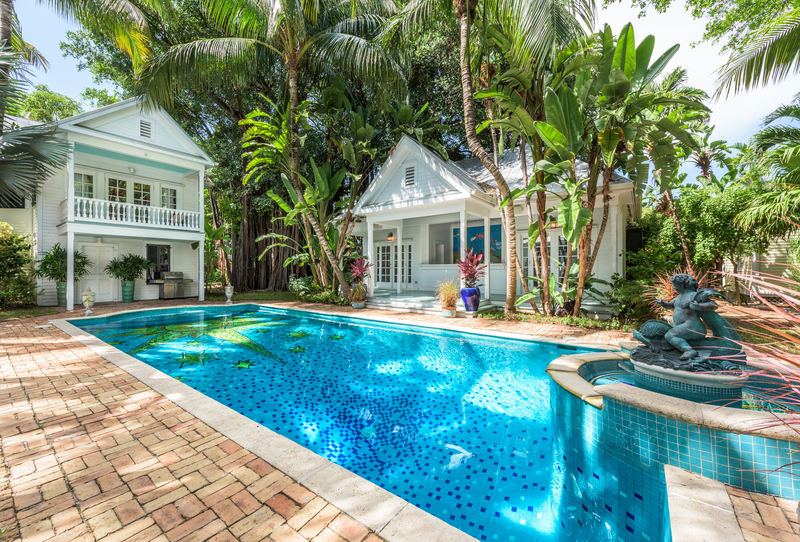 Click here to enjoy a virtual tour of this exquisite Key West estate. 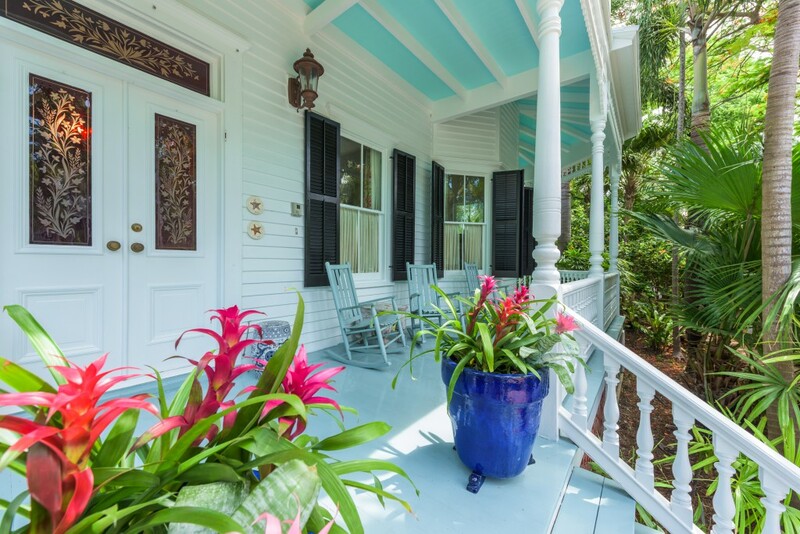 This entry was posted in Homes We Love and tagged front porches, gingerbread, homes, Key West, Key West cottage style, Key West estates, key west real estate, Old Key West, Old Town, pools, Queen Anne mansion, real estate, tropical gardens, Victorian gingerbread on July 31, 2015 by Dean.